Identity theft is a growing concern and shredding a document is the only way to ensure your personal information stays safe. GoECOlife™ is your green option for paper shredding. Find out more with our YouTube video about the range. The GoECOlife™ range is certified Carbon Neutral by CarbonFund.org and features the GoECO™ Power Save Switch which automatically powers down after 5 minutes of non-use which prevents costly phantom power loss. 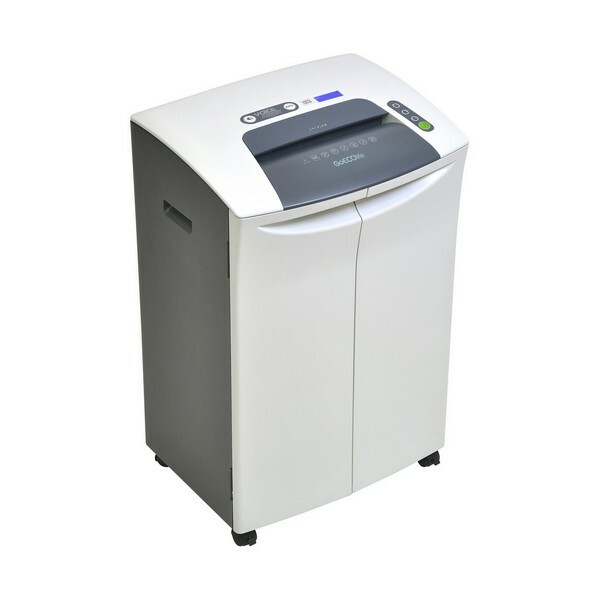 Energy-saving and carbon neutral shredder with high-capacity motor delivers commercial-grade performance, perfect for small to medium sized offices. Ultra-quiet operation so you don't disturb those around you and the Vortex Cutting System ensures optimal performance. 18 sheet capacity 4 mm x 40 mm Cross (Confetti) Cut (security level 3) shredder. Shreds staples, CDs and credit cards with a separate collection bin for plastic waste. InfoCenter LCD Panel displays 7 visual flashing alerts combines well with VoiceAssist Technology for passive, audio trouble-shooting. ZeroJam Overfeed Prevention Technology eliminates paper jams. 20 minute continuous shredding. 60 minute cool down. 37 Litre removable waste bin for easy emptying. T-Door space-saving design allows for easier basket removal in tighter spaces.